Shane Dawson is the YouTuber with millions of eyes on him. His informative, well produced, and deep-diving documentary series garnered millions of views and national coverage. He has now announced the subject of his next docuseries. It is someone who has many people questioning if the series will be one they’ll stick with through the announced eight parts. Shane’s next subject is the infamous Jake Paul. The series, set to be titled ‘The Mind of Jake Paul,’ began as an idea in July, earlier this year. 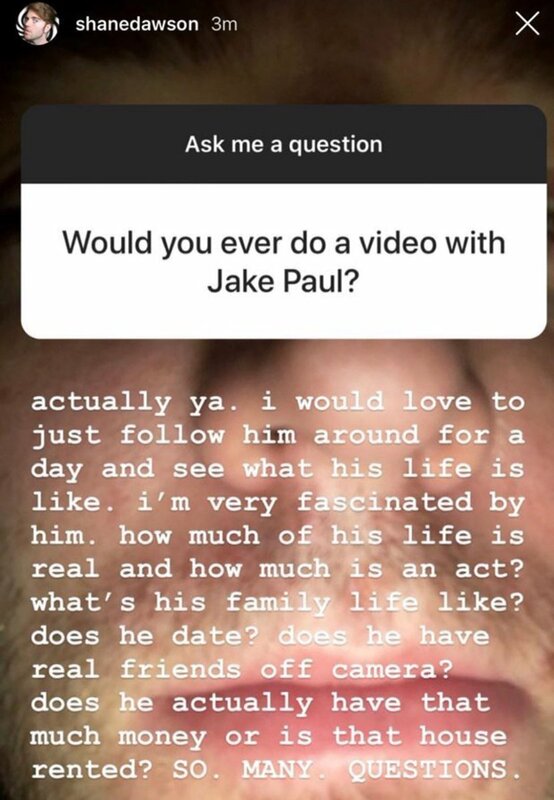 Someone on Shane’s Instagram asked if he would ever do a video with Jake, and Shane said yes, as seen here. Jake replied that he was interested. Shane posted about it again on Twitter, saying he’d be ‘genuinely fascinated’ to do a series about Jake. In the following months, someone managed to spot Shane and his cameraman, Andrew, in the background of an Instagram story at the Team 10 house. On September 3rd Jake Paul posted a random, unprompted gif of Shane on Twitter. All these teases and hints had both Jake’s and Shane’s fanbases whipped into a frenzy. Everyone is demanding answers and hypothesizing about what they could have planned. Finally, on September 11th, Shane Dawson posted a minute long teaser-trailer. Hyper cut with clips of Jake, Team 10, and various related controversies, the trailer almost instantly hit trending. Accumulating millions of views and tens of thousands of comments, the video has caught the attention of creators across the site and even some international media sites. Much of this conversation is centered around the last few seconds of the clip, where Shane says he’s worried that he [Jake] is going to be mad when he finds out what the series is actually about. Much of Shane’s audience are not fans of Jake and unsure of this new direction. The series will have eight parts, but Shane is definitely fully aware that the pilot is the only chance he has to hook many of those on the fence. There are several possible directions Shane could take The Mind of Jake Paul. He has been dropping hints around YouTube and Twitter for some time, egging on the hype but not giving much away at all. In a pinned comment on a video by Perez Hilton Shane says “The subject isn’t just Jake Paul. The subject is much much darker. And something you probably have dealt with some of your ex-friends. ;)”. His tweets leading up to the announcement were also cryptic and teasing. “It’s not what you think,” he said in one. In another, “I’ve never felt more drained, emotional, confused, excited, angry, yet creatively fulfilled in my life hahaha it’s been a month of filming”. When asked for a hint as to the subject of the series he said “it was supposed to be about a person, and then it became about a lot of people, and now it’s about everyone. hence my breakdown. Haha”. Many people have drawn a comparison between the title card for the series and the intro for true crime series. The general feel of the trailer points in that direction, and with the hours that Shane and his editor/cameraman Andrew are putting in, it’s definitely intentional. There is a strong likelihood that the series will take a darker direction than perhaps many people are guessing. Jake Paul and Team 10 has been embroiled in drama, false allegations, and various abuse accusations for the better part of a year. Shane has a personal interest in discovering what’s going on behind the camera and has proved to not be shy to ask uncomfortable and difficult questions. Without a doubt, the series will cause huge waves when it releases on the 25th of September 2018. The world will be watching to see what Shane Dawson has to say about the mind of Jake Paul. P.S. : Do you have an idea for a YouTube collaboration? Submit your idea now on Vlogfund.